This place in scripture reveals to us an amazing encounter. You may recall prior to this writing that John baptized Jesus in water, and the heavens were opened, and the voice of the Father spoke saying, “this is my beloved Son, in whom I am well pleased.” Following his baptism, verse 1 of chapter 4 tells us that Jesus was led up into the wilderness by the Spirit to be tempted of the devil. The scripture does not tell us how much time passes between the Lord’s baptism and the encounter we read about in the text. Nonetheless, Matthew records for us the Savior being tempted as the next event in the life of Christ following his baptism. In this lengthy account, Matthew depicts for us a rare occurrence where Jesus faces off with the one who seeks to destroy us all. Yes, the very devil himself would have loved nothing more than to have fooled Jesus into worshiping him instead of the Heavenly Father. He tempted the Savior with 3 things: the lust of the flesh, the lust of the eyes, and the pride of life which are noted as things of the world in I John 2:15-17. But isn’t that what Satan tempts us all with? He offers us everything that this world holds if only we will bow to him instead of bringing ourselves into submission with God. But notice also that the tempter comes to people when they are weak. Matthew tells us that Jesus fasted forty days & forty nights and was afterward a hungered in verse 2 of the chapter listed above. And perhaps the devil believed that Jesus would be in a weak frame of mind as he was famished from his fasting. And so he goes to Jesus and seeks to lead him into sin through temptation! But Jesus would not be deceived. Rather, in his famished state, our Lord was as bold as ever, refuting the tempter’s ventures to destroy him. Sometimes I wonder why we don’t respond the way Jesus did when the tempter comes our way. It’s safe to say that we have all fallen short when we are tempted. But does this happen because we ill equipped to combat the devil’s weapons? No, we just make up excuses to cover up for our lack of will power to resist temptation. Allow me to briefly note three tactics that a Christian may execute so to dispatch the great deceiver. First, a Christian must deduce that temptation becomes sin only when acted upon. I have found in my own life that it can sometimes be difficult to distinguish between when we are being tempted and when we have sinned. Lumping the two together into a category may cause us to believe that if we’re tempted, we’ve sinned. On the contrary, James writes in his epistle that every man is tempted (James 1:13-15). This servant of God highlights three sizable points in these verses. We just noted the first, but the other two are as follows: God tempts no man (1), and sin is the result of action taken when lust is experienced (2). After all, even the Lord was tempted as seen in the encounter with Satan in the gospels and affirmed by the Hebrew writer (Hebrews 4:15). Christ of course, faced the temptation without acting on it, leaving us the greatest example. We must strive to abstain from all sin, despite the reality that we will be tempted. Second, a Christian must resist the devil. A resistance constructed on the foundation of God’s Word is crucial to our preparation for facing the prince of darkness. Resisting the devil sounds simple enough, but applying this direct command is another story. Again, James writes, “Submit yourselves therefore to God. Resist the devil and he will flee from you” (James 4:7). The focus here should be on the former section of the verse. There is no better way to resist the devil than to submit to God’s will. James says that doing such will force the devil to flee from us! Imagine the pressure and power of temptation lifted from your conscience because you have wholly submitted yourself to the Father’s will! That is an amazing feat! In the 4th chapter of James’ epistle, he rebukes his reading audience about the lust in their hearts, particularly fleshly lusts. Having already explained that sin is the result of lust being conceived at the beginning of his letter, he writes about the necessity for them to draw nigh unto God, so that the Father would draw nigh unto them (James 4:8). The apostle calls for the purification of their hearts, so that they no longer think with a double mind! How is that accomplished? By submitting your mind and heart completely to God and His Word. When this is done, the devil will flee from us! Paul wrote to the Corinthians in the first letter, expounding on the idea that fleeing from sin would cause Satan to flee (I Corinthians 6:18). A Christian can turn from temptation when the tempter comes by resisting the devil. Last, a Christian should give a righteous response when the tempter approaches. There is possibly no better example of the righteous response than in the textual scriptures referenced above. 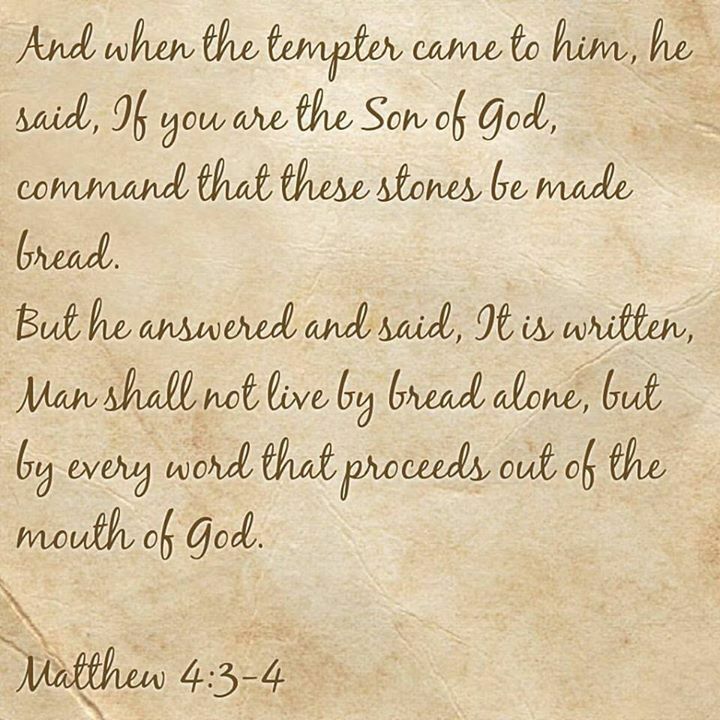 With each temptation presented to our Lord, a Biblical answer is given. How many of us calmly speak divine words to turn away the tempter? Most likely, we allow the temptation offered to weigh on us instead of abruptly responding with the inspired words of the Creator! The longer you allow the temptation to exist in your presence, the less likely you will be to send it away with a righteous response. So much there is to learn from the Christ, but too often we enjoy the pleasures of sin that stem from appealing temptations, never recalling how quickly these pleasures fade away. May we all seek to structure a divine foundation to stand on while we prepare for when the tempter comes.